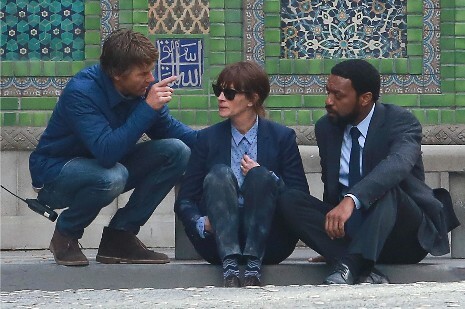 Julia Roberts and Chiwetel Ejiofor were sitting on an LA street filming a scene for The Secret in their Eyes when Julia’s husband Danny Moder, the cameraman, walked over to give the actors a few pointers. Julia’s role in this movie was originally written for a man but producers wanted her so badly they rewrote the part. Although her character still does look a bit mannish in that short wig and suit. The movie is a thriller about old friends who reunite to solve a 25 year old crime. Julia Roberts signed a lucrative deal with the Italian company Calzedonia, makers of hosiery, lingerie, and beachwear. For her first TV commercial she was flown from Scotland to Paris to Florence to film scenes and all she had to do was wear their black tights. She does have the long legs to make them look good. The ads will not be seen in the US. Julia Roberts looks like the most relaxed person at the Emmys and we love her for it. Her cute cocktail length dress shows off her long legs and her loose hair looks casual and comfortable. Somehow by not wearing a long extravagant gown she doesn’t seem to be shilling so obviously for some design company. Anyway, it’s a refreshing change. A friend of ours in Malibu needed something quickly from the market and drove to Pavilions there. It’s usually not all that busy and easy to get in and out quickly. But that day he found the parking lot jammed with cars searching up and down for a space. After circling the lot numerous times, our source found a spot and dashed in only to find the store packed with people just standing around. “What’s going ON here?” he asked a clerk. 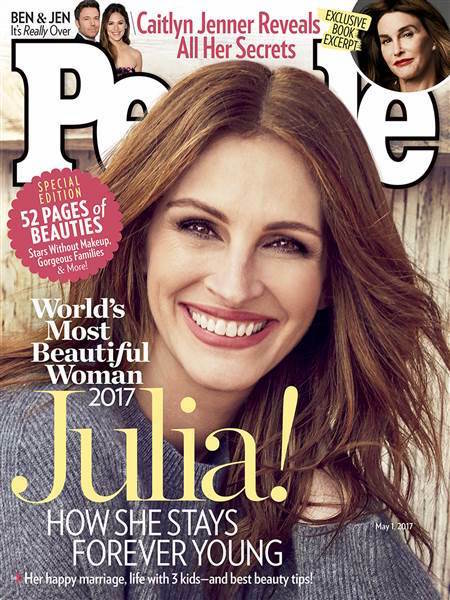 The checkout girl whispered “Julia Roberts is shopping and no one wants to leave until they see her!” It seems Julia was oblivious and pushing her cart up and down the aisles while shoppers around her flipped out. When word got around that she was there, shoppers just stopped leaving. Julia is rumored to have bought a house in Point Dume. Actually, Julia should be flattered because Malibu residents are rarely star struck! Here’s a front page that brings back memories! Twenty years ago Julia Roberts,25, was more fickle than Taylor Swift. She cancelled her wedding to Kiefer Sutherland a few days before the ceremony and ran off with Jason Patric. Later Julia shocked the world again by impulsively marrying country singer Lyle Lovett,35, whom she met while filming a cameo in The Player! They planned the wedding for two days and were married in a Lutheran church in Indiana. Thirteen months later the marriage was over. She’s calmed down a lot since then. Filed Under: Julia Roberts > Lyle Lovett > People > Remember? To no one’s surprise, “Transformers” trounced “Larry Crowne” at the boxoffice this weekend. The Julia Roberts/Tom Hanks recession dramedy’s reviews weren’t great, but the movie experience is actually quite pleasant. Granted, Tom Hanks is a rather pedestrian director, but he plays “everyman” to perfection. The script was sprinkled with predictable situations and familiar characters, but there were surprisingly special moments and Tom and Julia’s presence makes up for a lot. It’s a sweet well-intentioned movie and you’ll walk out of it with a good feeling. Which is more than you can say about Transformers.